This entry was posted in Eastside, Greater Los Angeles, Pendejadas, Photos by chimatli. Bookmark the permalink. That’s funny b/c today I was actually looking into apts lol thanks for the tip! You’re welcome! 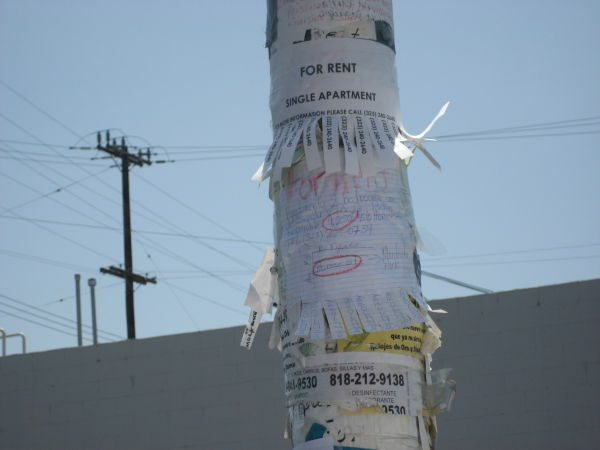 Another good way to find apartments is to drive around in the neighborhood where you want to move and look for “FOR RENT” signs. It’s how I found my place. Screw Craigslist, it’s for folks with $$$. Looking at poles also means you’re walking. It gives you a good sense of the community and it’s some good exercise. that is funny — about 15 years ago I used to post those in supermarkets, laundromats, and also on the poles here in the 90063. I would get inquiries as I was posting them in the supermarkets. I can only imagine that demand is much higher now with the limited housing stock and the bank/mortgage troubles.